What’s the latest news ‘buzz’ on campus? Three students in our Sustainability Studies Program are playing an important part in a new Bee Project here at The Orme School. This opportunity came about through a grant from The Whole Kids Foundation, for which Orme is very thankful. Director of Sustainability Services Patti Marrs, Director of Sustainability Studies Kelly Bull, and science teacher Sylvia Strobel have guided and helped those students since the project’s inception. 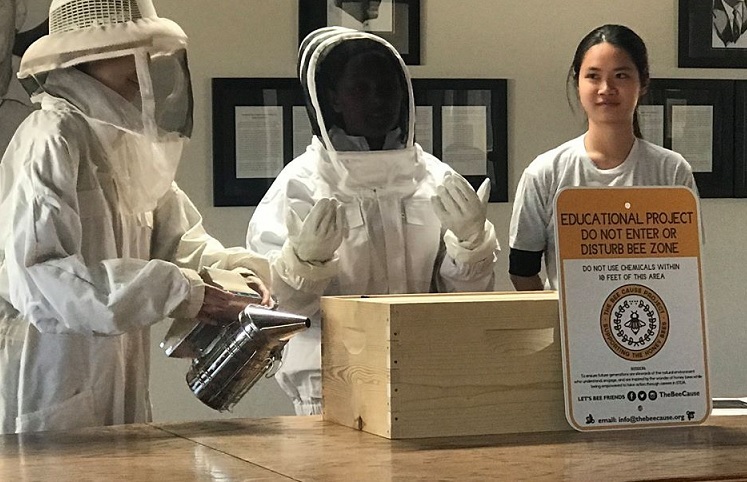 At a recent Faculty Meeting, the students (Valerie Tran, Nguyen Hahn Nguyen and Mary Abebe) gave a special – and very enthusiastic – presentation on the project, and even modeled their new beekeeping attire. The girls are very excited about bringing this sustainability project to fruition. The Orme School will soon become the happy home to a hive of honey bees, with an observatory-style hive on display in our Mosher Science Center. It will be used to inspire all of our students to learn more about the importance of bees, and their necessary role and positive impact upon our ecosystem.